Cause and effect is sometimes best measured by first looking at the effect. 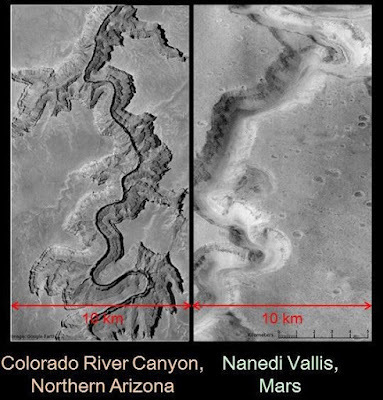 The Colorado River canyon, just above Grand Canyon (left), and Nanedi Vallis on Mars (right) pictured at the same scale shows how both canyons were formed by rivers that appear to have been approximately the same width. The river channel on Earth looks darker because it is filled with water, whereas Nanedi Vallis is dry and has been for quite some time. "If we compare some of these valleys on Mars to what we know on Earth, for example the Colorado River, then they look to be the same width," said James Kasting, Evan Pugh Professor of Geosciences, Penn State. "We know how much water it took to carve the Grand Canyon based on five to six million years of rainfall, which is estimated to be about three to six million feet (of rainfall)." In 2014, Kasting's group proposed a climate model showing Mars warmed by a dense atmosphere of greenhouse gases, specifically carbon dioxide and hydrogen. In a recent issue of Icarus, they report that using a photochemical model, they determined the possibility that there was a high percentage of hydrogen in the atmosphere. According to Batalha and Kasting, photochemical models simulate different aspects of the atmosphere using mathematics to determine the chemicals and how they react. They also set limits that define what is happening at the surface and in the atmosphere. "The main focus of our work was how can you, and is it even possible to, get a 5 percent hydrogen atmosphere because 5 percent is a lot. Terrestrial planets don't usually have that big of a hydrogen envelope because it escapes pretty easily," said Batalha. A competing hypothesis, called the impact hypothesis, claims that the high bombardment of asteroids on the surface of Mars led to a temporary warming, causing steam atmospheres that then condensed and produced rainfall that carved the valleys on Mars' surface. However, that would have generated only around 1,500 feet of water, while the Grand Canyon took millions of feet of water to form, according to Kasting. Data gathered by NASA's Curiosity Rover, launched in 2011 and currently on Mars, suggests prolonged, standing liquid water was present in Gale Crater. According to Batalha, further evidence showing water stayed on Mars for tens of millions of years would support a warm early Mars while putting the impact hypothesis to rest. "While Curiosity couldn't directly prove our hypothesis about a high hydrogen atmosphere, if you get millions of years of warmth, then you're driven towards hydrogen because we haven't been able to figure out any other way to create that warmth. All of the other greenhouse mechanisms fail in our models," added Batalha.